Besides the busy day of ice cream on Tuesday, not much has been going on around the Toone household. I’m trying to be better about not overdoing so that in the evenings I’m not feeling too bad. I’ve had some nice quiet afternoons scrapbooking, while Analise plays around my feet – literally. In case you missed the photo in the 39 Easter Photo post, she’s quite infatuated with toes lately. She wakes up from snuggling in our bed in the mornings or after a nap saying, “Whe’s toes?” and goes looking for our feet. Then she always says, “Hey, toes!” I think she’s particularly pleased with my toes… they look really nice after my pedicure on our trip last weekend:) But if I’m at the computer or the table scrapbooking, she enjoys coming to play with my toes every so often. Anyway, it’s been nice to be scrapbooking. I’ve got tons of fun scrapbooking stuff that I’m always looking to use, and I’ve got loads of photos from Analise’s early days to use. Tonight we’re going to the Spring Fling at Brian’s parents church. Games, booths, pizza, popcorn and hot dogs… should be fun. Then I think we’ve got some errands to run that I’ve been avoiding doing by myself. Groceries and Home Depot – how’s that sound for a fun Friday night? Tomorrow Brian has a meeting at church in the morning, and then we’ll head to Oak Mountain State Park for a Samford Computer Science Department picnic. Should be a nice day! Have I mentioned that my husband is amazing and is taking such good care of me? He’s doing so much lately, and this is his busiest time of year at school. He’s awesome… I hope he knows how much I appreciate him! We’re on our way out the door for FREE CONE DAY at Ben & Jerry’s. Woohoo! If there’s one near you, I hope you get a chance to take advantage of this, too! Maybe we’ll even get a picture! browser to continue to view more pictures. easter eggs at the first ever Clearwater Easter Egg hunt. this year. Beautiful pink and white flowers. When we got there, there were Easter eggs everywhere! Analise reaches for an Easter egg at the base of a pine tree. Kristine holds Analise’s bunny easter egg basket. Analise and grandma walk back to us after visiting the ducks by the lake. Analise dances and plays in the dirt. the corner of it over herself like a blanket. the next piece of food. Smiling again, this time next to a well full of Easter lilies. are all of Analise’s friends from church. Analise inspired everyone to wear hats … including her mommy! a short bike ride before dinner. Our B & B was just up the mountain on the right. that spans the Tennessee river. Here is the view of the sunset sky and the Tennessee River walk. a large tree growing on the side of a cliff on Lookout Mountain. from Chattanooga straight up to the top of the mountain. Here is the view from the halfway point looking back down the mountain. this one growing out of, between, and over rocks. The happy getaway couple next to Mushroom Rock. I think Kristine was tired of me taking her picture by this point! platform for the waterfall in the background. just walked across a few minutes earlier. Here is a pretty purple tree next to the walking path through Rock City. drops dramatically straight down to the river. You might be wondering if we decided not to return from our short weekend getaway, since we haven’t posted in a while:) We did come back Monday evening, after 30 lovely hours of relaxing together in Lookout Mountain, GA. Brian prepped all the pictures to post, but I can’t seem to find them right now. And if I don’t post a blog now, it might be a while until I get back to it! My husband is amazing… He picked a super location for both of us to enjoy. I would have been happy anywhere, just for a bit of time without mommy duties, and maybe a whirlpool to soak in. BUt Lookout Mountain, GA and Chattanooga, TN on a quiet Easter Sunday/Monday were perfect for both ofus. I think I’ll save the rest of my detailing for the post with the pictures. We had a great Easter weekend, with an Easter egg hunt on Saturday and dinner with Brian’s family that evening. Sunday morning we went to early church at Brian’s parent’s church, and then worked in the nursery at our church. Then we dropped a sleeping Analise off at her grandparents while we headed off together. She had a wonderful time with Boppa and Bwacca (honestly, Analise came up with these names all by herself!). It’s been a quiet week. Brian’s super busy with the semester coming to a close in less than a month. Today was Earth Day, and he had one of his classes working on a presentation for that. I’ve been chasing my busy girl and trying not to aggravate my back too much. Exciting news… we just found out our friends Steve and Corrie are coming to see us in August! Yeah!!! We’re going to have a fun busy summer of visitors with my mom coming for most of June to help out with the new little one, my dad coming for a bit in late June, and the Hafflys in August. Anyone else want to come? We’d love to have you! Ok, hope to be back soon with Easter and other pictures! Oh! We’re telling people the name we’ve chosen… with a little encouragement, maybe I’ll post it later today! The other thing very different about this pregnancy is that we’re seeing a regular OB instead of a midwife, like we had in California. Our whole pregnancy/labor/delivery experience in California (at Sutter Davis Hospital) was top notch, and we really loved the care we received from the midwives. Midwives are trained to approach prenancy from the perspective that it’s a normal process in a woman’s life. They were very “hands off” (though that was hard in the middle of my pregnancy when I really needed some “hands on” care… but it did get remedied). The midwife was with me for the whole delivery process, and she guided us through a long, complicated labor & delivery – that we didn’t even really know was that complicated until it was all over! Sutter Davis has a small birthing center, and it felt so different from the hospital we’ll be delivering at here in Alabama. We like our OB, and he came very highly recommended. But from the very beginning, we’ve noticed that the care is definitely approached from a medical perspective. “Any problems? No? Ok, we’ll see you in 4/2/1 week(s).” (usually the total conversation of our 5 minute visit.) This is just the standard of care here, though, as compared to California. Anyway, all this is just our perspective. I’m sure we’ll have very good care here, though it may be different. Since we’ve been through the process before, we know a bit more about how to be our own advocates and communicating how we’d like things done. I’ve got some pictures from our Clearwater Easter Egg Hunt last weekend, but I’ll save them for posting later, as we’ve got another hunt this morning. None of these compare to THE HUNT in Indiana, when my family gathers in LaPorte for Easter. We’ll be missing that today, sadly, but maybe next year! I just made some pretty blueberry pancakes with star molds that I got in a free offer from Hungry Jack. Topped them with strawberries… YUM! Off to shower and get ready for the egg hunt and our family Easter dinner tonight. After church tomorrow, Brian’s stealing me away for the night to a bed & breakfast as a belated birthday treat. Woohoo! I can’t wait! Ok, I know it’s almost too late for this to do anyone any good, but I just stumbled across some pretty Easter basket ideas. 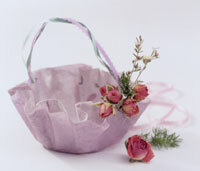 If I didn’t have such a busy day tomorrow, I’d make some of these pretty Thread Eggs to fill these Ruffled Paper Baskets. We recommend baking these cookies on the Saturday night before Easter. But before you start, read the full recipe and collect all the materials and ingredients needed. As you make the cookies with your child, read aloud the Scripture story of Jesus’ crucifixion and resurrection where inserted in the recipe (highlighted in black after each numbered direction). 1. Preheat oven to 300°F degrees. Place the pecans in a plastic freezer bag. Let your child break the pecans into small pieces by beating them with a wooden spoon. Explain that after Jesus was arrested, Roman soldiers beat him. 2. Now, ask your child to smell and taste the vinegar. Add 1 teaspoon vinegar to a bowl. Explain that Jesus was offered vinegar to drink while He hung on the cross. Later Jesus said, “I am thirsty.” He knew that everything was now finished. He knew that what Scripture said must come true. A jar of wine vinegar was there. So they soaked a sponge in it. They put the sponge on a stem of the hyssop plant. Then they lifted it up to Jesus’ lips. 3. Add the 3 egg whites to the vinegar. Discuss with your child that eggs represent life. Explain that Jesus gave his life in order to give us life. “The thief comes only to steal and kill and destroy. I have come so they can have life. I want them to have it in the fullest possible way. 4. Sprinkle a pinch of salt into your child’s hands. Allow them to taste a tiny bit and shake the remainder into the bowl. Explain that this represents the salty tears shed by Jesus’ followers. 5. Gradually add 1 cup of sugar to the bowl while beating ingredients on high with a mixer. Explain that the sweetest part of the story is that Jesus died because He loves us. He wants us to know we belong to Him. 6. Egg whites are ready when they are glossy, white, and stiff peaks form (peaks stand straight when beaters are removed). Share how the color white represents purity and how Jesus can cleanse us of our sins. 7. Now, add the nuts and fold in gently. Drop the mixture by teaspoon on a cookie sheet covered with wax paper. Explain that these mounds represent the rocky tomb where Jesus’ body was laid. As evening approached, a rich man came from the town of Arimathea. His name was Joseph. He had become a follower of Jesus. He went to Pilate and asked for Jesus’ body. Pilate ordered that it be given to him. 8. Put the cookie sheet in the oven. Then close the door and turn the oven off immediately. 10. Go to bed! Explain that your child may feel sad to leave the cookies in the oven overnight. To a much greater extent Jesus’ friends were sad when He died and was placed in the tomb. 11. Do not open the oven until the following morning. Allow your children to examine the cookies. They will form small mounds and have a cracked side. When the children taste them, they will discover that the cookies are hollow representing that on the first Easter, Jesus’ friends were surprised to find the tomb empty. The Sabbath day was not over. It was dawn on the first day of the week. Mary Magdalene and the other Mary went to look at the tomb. There was a powerful earthquake. An angel of the Lord came down from heaven. The angel went to the tomb. He rolled back the stone and sat on it. His body shone like lightning. His clothes were white as snow. The guards were so afraid of him that they shook and became like dead men. So the women hurried away from the tomb. They were afraid, but they were filled with joy. They ran to tell the disciples. Suddenly Jesus met them. “Greetings!” He said. share all the sweet moments. 1. Analise slept until 7:15am! That’s almost a record! paper, definitely the largest birthday card! 5. Brian’s parents came over with a pretty boquet of roses. 6. Analise was full of hugs when I was holding her, heading to my bed for her nap. She’d say, “hug!” and throw her arms around my neck and follow it up with a kiss. So sweet! 7. Brian’s parents took Analise overnight (she had a lovely time, of course), and I was relieved of my mommy duties for about 18 hours, including dinner, bath, bedtime, and breakfast. 8. Brian took me to Macaroni Grill for dinner, which was EXCELLENT, and its our new favorite italian restaurant. 9. Then we enjoyed a relaxing time at Barnes & Noble browsing and reading to each other. 10. We capped off the evening out by meeting 8 friends from church at The Cheesecake Factory… our 2nd time there in less than a week:) Great cheesecake, as usual. I had tiramisu cheesecake, and I think it’s my new favorite. We had such a fun time hanging out with our friends, too! 11. It was wonderful to come home and not have to worry about Analise waking up sometime during the night. The house was quite messy, as I’d spent the day scrapbooking, and Analise’s toys were all over, as were goldfish crackers. (My birthday present to myself was to avoid bending over to pick up anything so that my aching back would feel a little better.) My most amazing husband picked up the toys, and then decided since Analise wasn’t home to wake up, he’d VACCUUM the den – at 11:30 at night! Amazing… what an act of love! Can you tell it doesn’t take much to make me happy these days?? 12. Lastly, we’re going away on Easter Sunday for a night of rest and relaxation. It’s a suprise as to where we’re going, but Brian’s assured me he’s got some nice plans. 13. I got fun cards, both online and in the mailbox. Analise has enjoyed all of them… she watches the online ones over and over and colors on the cards and envelopes that come in the mail. What a list! There are plenty of things I left out, like the presents that have come in the mail, etc, but know that they were much, much appreciated. I’m such a lucky woman, and it was a wonderful day and I felt very “celebrated”. Thanks for thinking of me! I am so blessed and loved! God’s been so good to me! It’s time to catch y’all up on photos from the last couple weeks! Above is from 2 weeks ago this Saturday, when we picnic-ed with Toones at the Birmingham Botanical Gardens. The trees and flowers were beautiful, and we snagged this family photo in front of a bright area of tulips. Unfortunately, it was impossible to catch Analise’s smiles that day as she ran all over the gardens. This past weekend my Grandma Vivian and her husband, Charlie, made the long journey to Alabama from their home in Indiana. We had such a wonderful weekend with them! Analise loved having them to play with. She enjoyed climbing up on the couch next to them to read together. I think she was planning to go back with them, too! First, she somehow managed to drag Charlies hardback suitcase into the living room. Then she plopped down next to Grandma to study the map in detail (she even said it was a map – her daddy’s passed on his love for maps even at this young age!). Then, while we were all in the living room, she disappeared for a bit and returned with a set of keys that we finally figured out were for Charlie’s suitcase… they’d been inside! Sure enough, she’d opened it, and was packing her animals inside, and sat herself right down in it, ready to go:) Grandma just told me this morning that they found 2 of Analise’s toys stuck inside Charlie’s shoes that had been packed in his suitcase when they arrived home! If she couldn’t go, she found a way to send a bit of herself home with them. Lastly, a couple cute pictures from this week. Only this first one needs explanation: While we were in the kitchen getting ready to bring dinner to the table, we heard Analise clinking silverware in the dining room. She was up on the chair, transferring Brian’s salad from the bowl to the table, carefully picking out her favorite, the croutons.